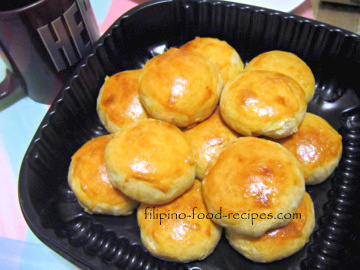 Hopia is a flaky pastry with sweet filling of either adzuki(red bean) or mungbean (green or yellow). The crust is very similar to that of the empanada, except that it's not as sweet since you already get that from the filling. I'm doing an easier crust for this particular recipe wherein there is only one dough to make instead of having a dough and roll-in fat, as in this recipe. Though not as flaky, this is better to do first if you haven't tried your hand in making any pastry. Note that the vinegar in the recipe is not a mistake. It is there to relax the gluten in the flour, making it easier to handle. 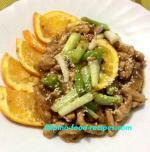 As for the filling, you could use green or yellow mungbean. 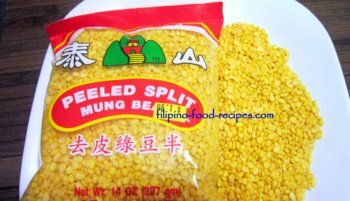 You can get the peeled and split yellow mungbeans, which are easier and faster to cook. 1 Mix the filling ingredients and cook in medium heat for 10 minutes. Refrigerate to cool down completely. 2 Mix together all the dough ingredients and roll in 1" tube and wrap with plastic. Refrigerate for 15 minutes. 3 At this stage, you could preheat the oven at 400 °F. 4 Take the filling and dough out of the refrigerator and cut dough in 1/4" discs. 5 Flatten each disc to make a 2 inch diameter and scoop 1 tablespoon filling and wrap and seal the dough around it. 6 Press the dough ball to flatten, sealed side down, at about 1 1/2 inch diameter and 1/4 inch thick. 7 Lay the pieces on a baking pan and brush with eggwash. 8 Bake for 15 - 20 minutes, the top should be golden brown. Do not overcook even if the top is not that golden brown yet. The dough and filling will completely dry out if cooked for too long. For uniformity, you could weigh the first few pieces of dough before assembling. After the first 5 pieces, you could pretty much gauge the weight by touch. For a real flaky and better tasting crust, use the dough at this recipe..